Several small projects were part of the Construction Extravaganza right from the start, and others developed as part of the process. 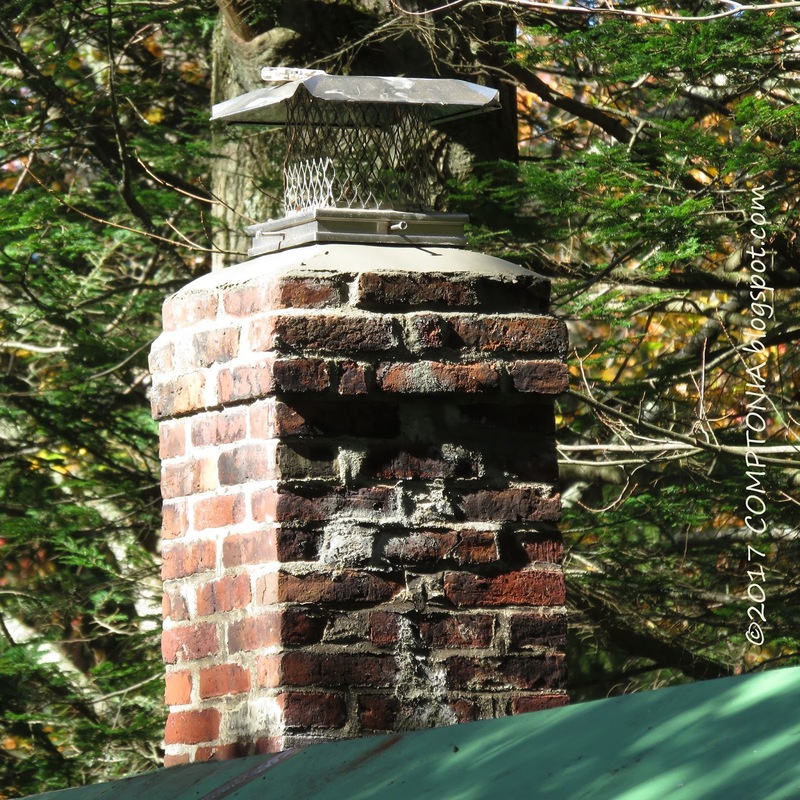 Here is one of the first category: the chimney. 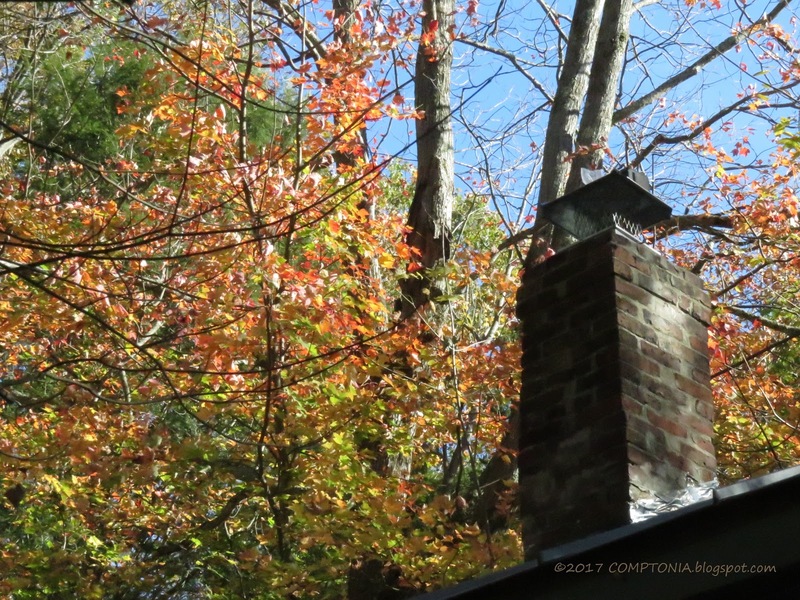 When I bought the house, the chimney was venting both a propane space heater in the parlor and a massive old propane kitchen range of which I think two burners were functional. I might have tried to have that range repaired, but the amount of space it occupied it this tiny house was hard to justify. Instead I decided to remove it and do without a stove until I could design a little kitchen and put in a wall oven. Looking back, if I had known that I'd be cooking in a toaster oven for a couple of decades before I could make the kitchen happen, I might have made a different decision! But it all worked out. Flashing and loose bricks removed. When I was working in one of my first forest-related jobs, I bought my little woodstove: a Waterford, from Ireland. Friends from work helped move it into my parlor, and that was a learning experience for me: I learned that there are some tasks one should not allow friends to tackle, period. It was a good lesson. 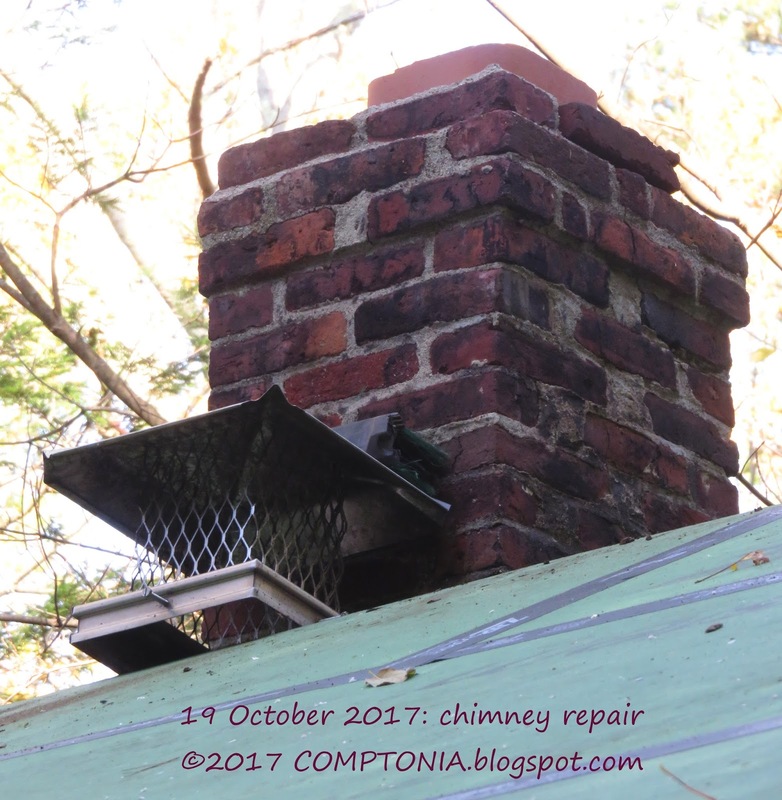 19 Oct: chimney tile extended; spark arrestor standing by. 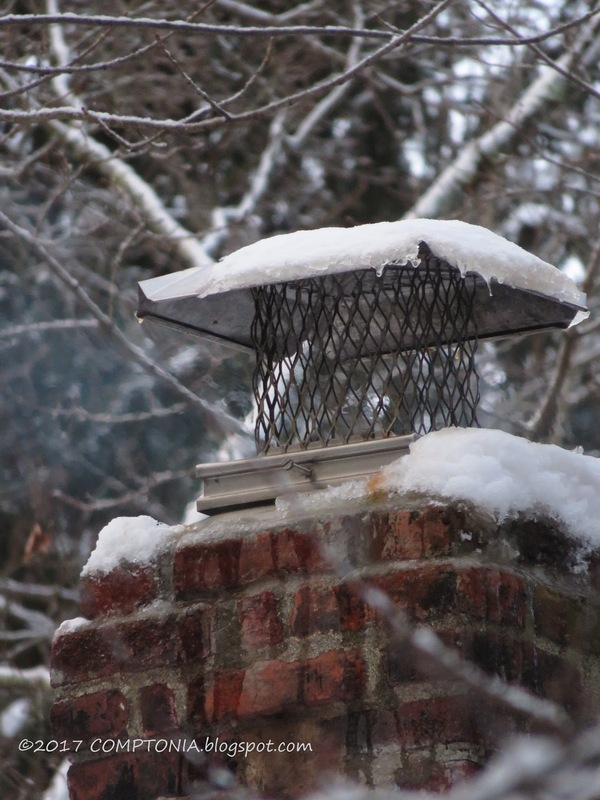 I almost changed my mind before buying the Waterford, because I was told I would have to put a liner in the chimney. 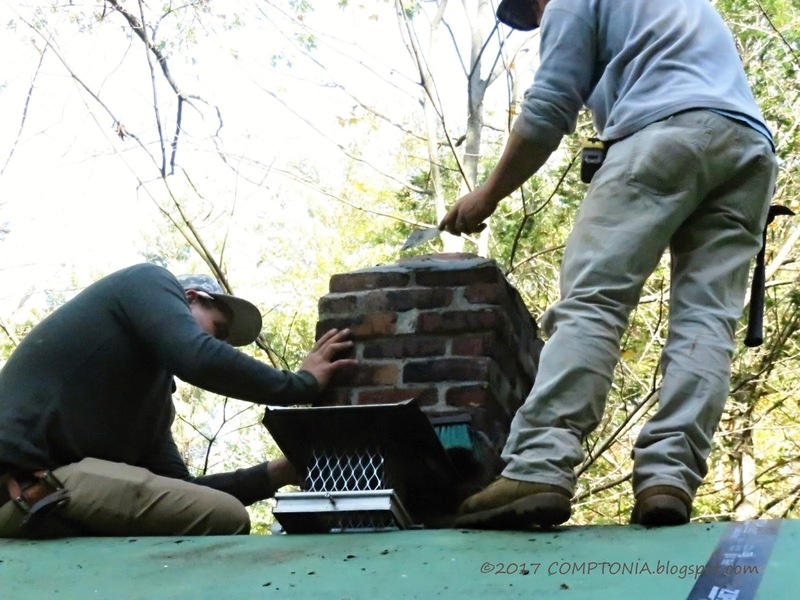 But when I clambered up on the roof, I found that the chimney was lined with tile but for some reason the top tile was lower than the crown. 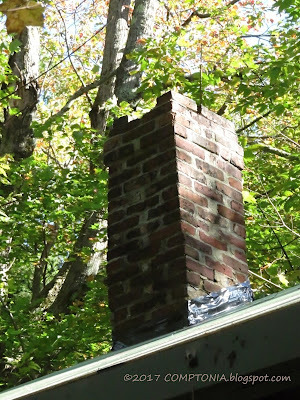 So I put "add one tile to chimney" on my List. That was in the early 90s. You've got to love a carpenter who has built chimneys. Apart from cleaning the chimney every year that I burned wood, I did no other maintenance. 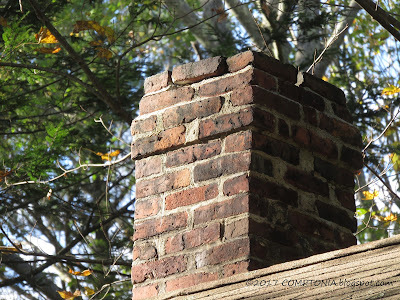 The last few times I was perched on the roof performing acrobatic stunts with the comically wobbly chimney brush, I noticed mortar beginning to crack between a couple of bricks on the top row. 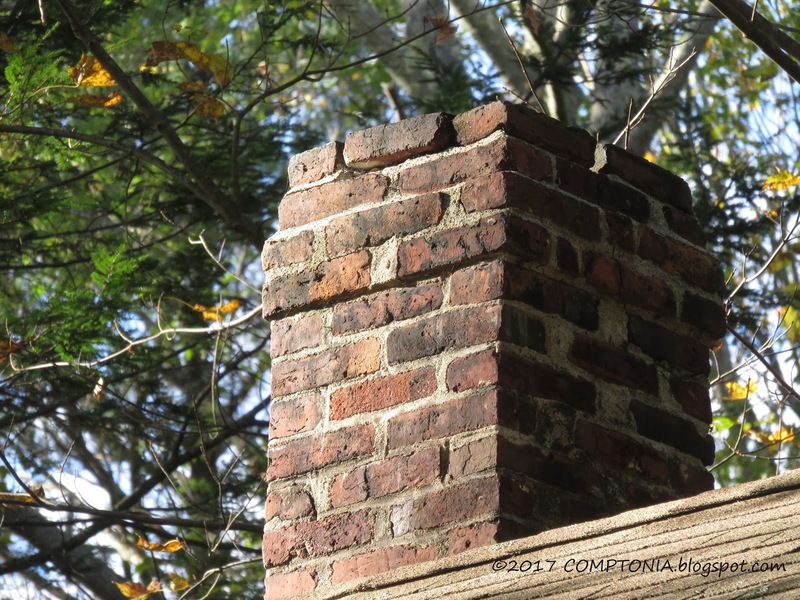 So of course I added "clean and remortar loose bricks" to my List. And last year I bought a nearly-new spark arrestor cap for $20 at a tag sale held by the local Animal Control facility. A very useful improvement, but it wasn't even ON my List, darn it! 26 Oct: work stopped by days of torrential rain. When I knew I would have to reroof the house, the chimney tasks - tile, mortar, cap - were naturally included in that project. 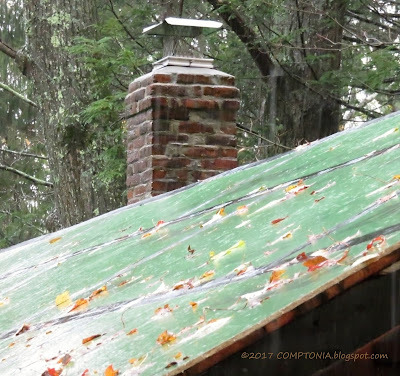 The repair and improvement was done before the metal roofing went on, and then the carpenter constructed a custom flashing for it, using the roofing material. 27 Oct: a wonder that rain left any leaves on the trees! The chimney had a long rest in November, waiting for me to dismantle and clean the stovepipe in the parlor - always a dirty, back-aching, mess-making chore. This year I also had two helpers who would have been happy to track soot all through the house on their eight little feet. And I did it on my birthday - don't tell me I don't know how to have a good time! Or age gracefully! Early the next morning I lit the fire. There hasn't been snow on that chimney since. And there probably won't be til Spring. I wish you could hear the sound of the wood tumbling! It's like the happiest thunder in the world. I always try to stay a full year ahead with stovewood, but don't always manage it. As this Winter approached, I felt quite comfortable if not actually smug. I'm expecting to burn a LOT of wood this year. 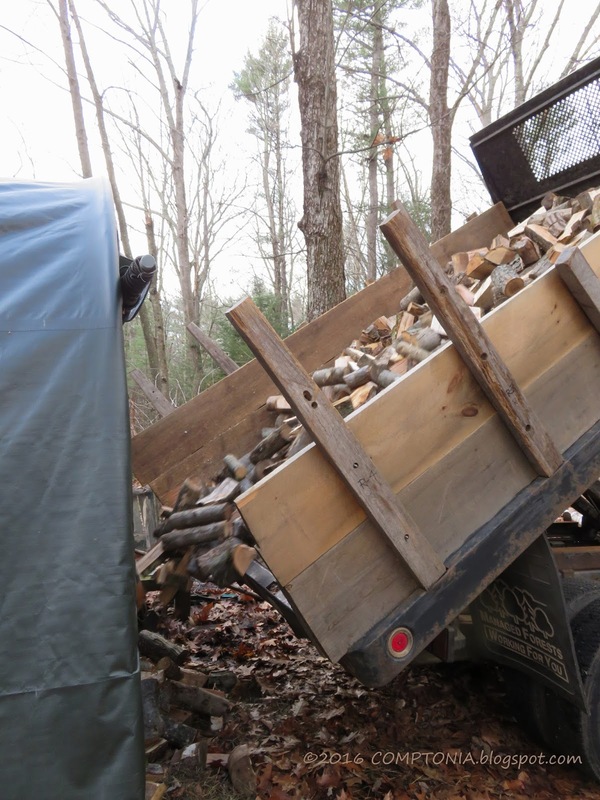 And I have a lot of wood to burn. I'm rich! Rich, I tell you! 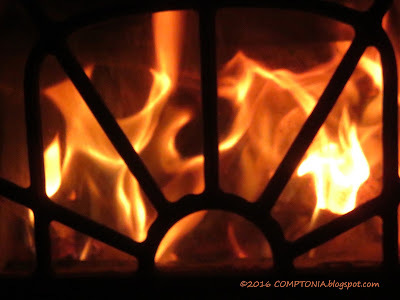 As cold as it's been already this year - minus 4F this morning and up to a rollicking 8F at noon - the stove has been kept well fed. I wonder how much of my massive stockpile will be left when Spring rolls around?